The Integrative approach to health is a client centered approach which focuses on healing, and nurturing wellness from within. In this process, the practitioner and the client are in partnership to assess and address the aspects and factors which contribute to the creation and maintenance of good health. The practitioner is committed to the practice of best medicine, whether it is conventional Western medicine or alternative, or complementary healing modalities and techniques. The Duke Wheel of Health beautifully illustrates this approach to health and healing. 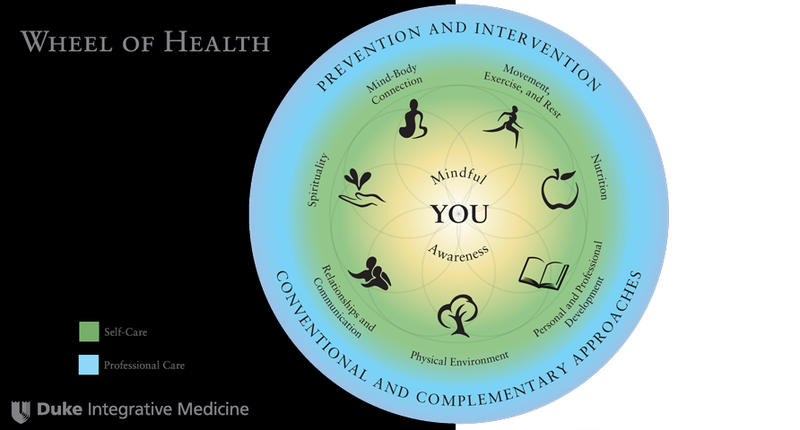 At the center of the wheel is YOU with Mindful Awareness and Self Care of the many components of good health: Movement, Exercise and Rest, Nutrition, Personal and Professional Development, Physical Environment, Relationships and Communication, Spirituality, and Mind-Body Connection. The maintenance of optimal health requires the individual to be mindfully aware of these many facets of health on the wheel, and to monitor and make adjustments as needed for balance and harmony. At the outer ring of the wheel is Intervention and Prevention—the conventional and complementary approaches in professional medical care.